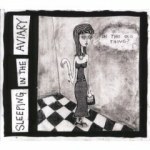 Sleeping in the Aviary: Oh, This Old Thing? Wisconsin trio marry Buzzcocks-like punk-pop with Pavementy indie rock. This trio of scarf-wearing Wisconsinites marry the treble-loving punk-pop of Buzzcocks with the ramble-shamble indie rock of Pavement on their first album, Oh, This Old Thing?. Other influences abound, as well; all of them prime grade. Catchy promo track "Another Girl" has the same full-throttle appeal and melodic movement as a good Thermals song, while "Gloworm" rides a sweet, garage groove that's part surf beat and part T. Rex chord changes. "No Socks" could have been penned by Devoto and Shelley circa '77. Not to imply that Sleeping in the Aviary are pointlessly derivative. They have their own way of stacking their influences on a skewer and roasting 'em up. Even though Oh, This Old Thing? only lasts 23 minutes, it sure is a tasty good debut.